Big Money Bracket Racer Lane Dicken from Lebanon, Tennessee is our first featured racer on DRR Dozen Questions presented by Brodix. In 2018 DRR will be interviewing some of the nation's most prolific racing members of our sport. Stay tuned for someone new each month. Thank you to BRODIX for making these interviews possible. DRR - Lane welcome to 2018 Dozen Questions presented by BRODIX. 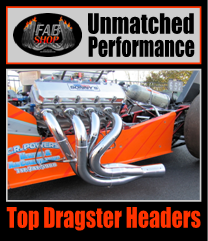 Please tell our readers about when did you first got involved in drag racing and who got you started? Lane - I've been going to the track with my dad since I was a baby, but got my first opportunity to drive when I was 16 in 1992 in my dad's 1970 Nova. The car ran in the 10s on the quarter and my racing addiction was solidified with that first run. I've been racing with my dad ever since. DRR - You seem to have a unique racing partnership with your buddy Jeff Burns. What seems to make this work so well? Lane - Jeff and I have always liked hanging out together on/off the track and started doing so probably around 15 years ago. Jeff is someone that really likes to win, but also finds a way to have fun even under the worst circumstances. He works extremely hard, but plays hard as well which is kind of what racing is all about. It takes a lot of effort for everyone to get their cars to the track, but it's very rewarding when things work out. Sometimes I can get too worried about details or something going wrong and Jeff's outlook balances that out in an unconventional way. DRR - What do you think our readers would be surprised the most to learn about you? Lane - On a Racing Perspective - we've quietly had a bit of a good run for the last 3 years leaving the house to race 25 times and making the quarterfinals or better 19 times with finals including an 8k, (3) 10ks, 20k, 25k, 50k, 100k, and Spring Fling Million. Many of the finals ended with me getting whipped by stellar door car opponents, but we did manage to win a few of them too. On a Professional Perspective - I've recently left an 18 year career in the aerospace industry where we designed/built cryogenic coolers for infrared detectors and onboard oxygen generating systems for military aircraft pilots. My professional life has turned 180 degrees in the last 6 months becoming a full time dad and recently opening a car lot (Elite Automotive Center; shameless plug) in Murfreesboro, TN with Josh and Tucker Kanselaar. 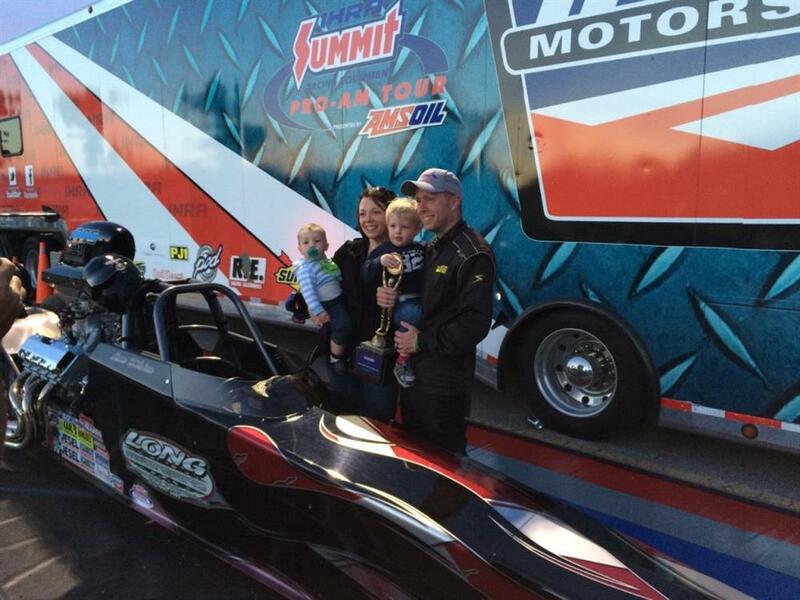 Lane has even seen victory in some IHRA Top Dragster action a few years ago. DRR - You've been an engineer by trade. Was that something you always wanted to do when growing up or was there something else? Lane - Engineering and, believe it or not, math has interested me for as long as I can remember. I think my mom helped guide me toward engineering as she saw that it would be a good fit with racing and was complemented by my strange affinity for math. I believe she just wanted me to have a backup plan in case my racing dreams didn't pan out! DRR - What racing accomplishment do you feel has been the biggest so far in your career and why? Lane - I think success at any level of racing (even golf cart races) is extremely gratifying and keeps bringing me back to the sport. That, coupled with the off track relationships and wonderful people in the racing community, is why I love this sport. As far as individual accomplishments, it would have to be the Mid Michigan World Super Pro Challenge $50k win, Spring Fling Million runner-up to Jeff Verdi, or most recently the SFG $100k win in Reynolds, GA. The Mid Michigan $50k - this is one of the longest running big money bracket races ever and was one of the greatest nights of my life. I still remember Troy Williams Jr jumping the guardrail to give me a beer on my way back up the track. I've been unsuccessfully trying to be the first repeat winner of that race ever since. The Spring Fling Million runner-up - This was the inaugural million dollar race in Las Vegas and largest purse I've ever raced for in a final. Even though I lost the final, it's one of my best days ever at a racetrack. 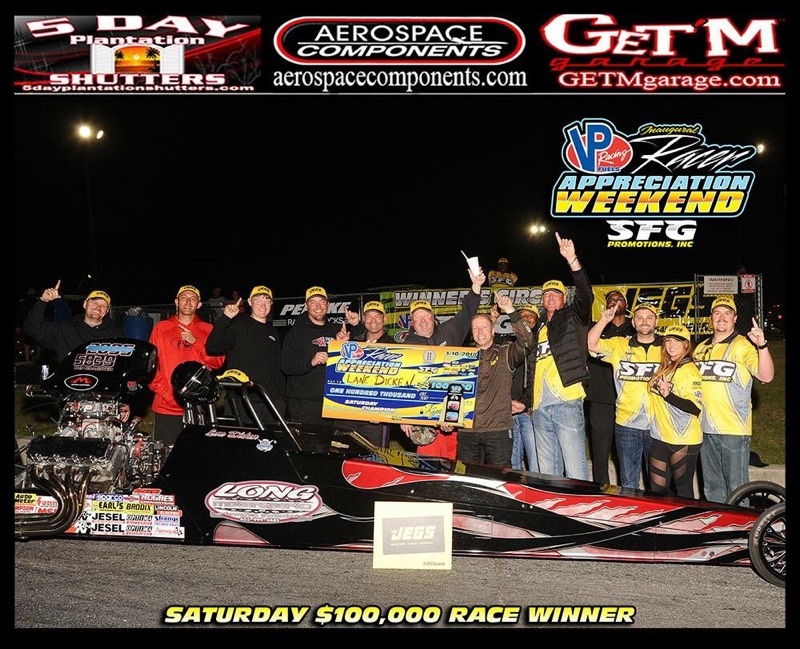 The SFG $100k - Most recent big money race win and largest win of my career. Racing one of my bracket racing idols, Jason Lynch, in the final and fortunately having the win light come on in my lane. We were ready to load up and go home before the race due to issues with the car and ended up in the winner's circle. 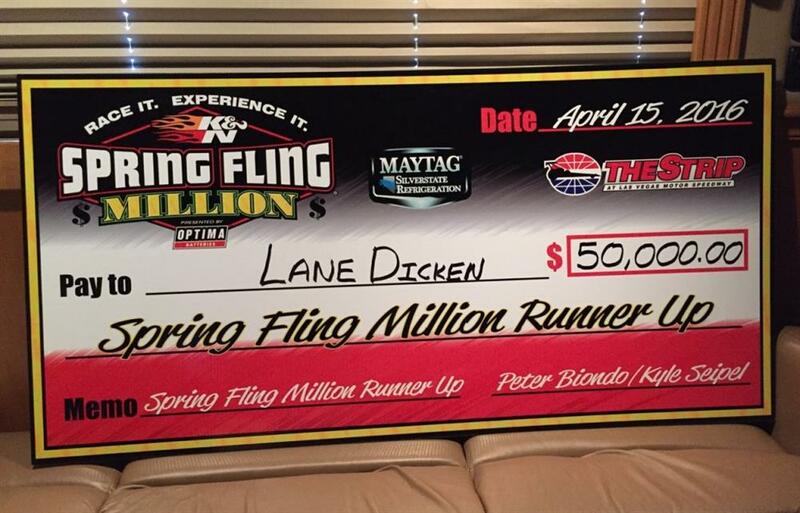 Lane pocketed $100k for his largest win in his carrier last month at the SFG race in Reynolds, GA.
DRR - I know you and your wife recently moved to the country. What's the plan to keep the property mowed? Goats, hiring it done or are you a tractor guy? Lane - Due to my recent significant drop in regular income and deciding to become a full time stay at home dad, I will definitely be a tractor guy and may even consider some goats! I spent almost 6 hours on the mower yesterday. It will be nice when my kids are old enough to mow by themselves as opposed to sitting on my lap "helping" me mow the grass, Although that's pretty great too! 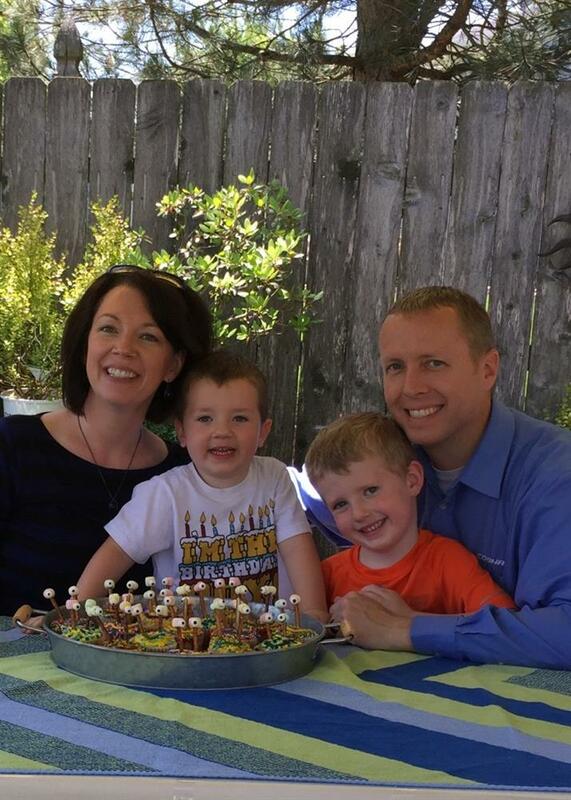 Lane and Sara Dicken along with their 2 boys Andrew and Daniel. DRR - When you're not racing what do you enjoy doing for entertainment? Lane - Any time we can get together with friends, I couldn't be happier. Whether it's going to dinner, grilling at home, or going on a dream vacation to Aruba with the Burns, Long, and Lemen families! That's my kind of entertainment. DRR - If you had to choose another form of motor sports to participate in, what would that be and why? Lane - I've always been intrigued with the power to weight ratio of sprint cars and thought they would be the most fun thing to drive. Now that I'm 42, I'm probably too scared to drive one even if I got the opportunity! DRR - If I lost the bet and had to take you out for dinner, where would we be going? Lane - It depends on the size of the wager. If the budget is unlimited and can include international travel, I would definitely choose a return trip to Aruba to get "Rudy" and have a steak. But any local place with chicken wings or good burgers would be great also. I was recently introduced to Rodizio Grill Brazilian steakhouse in downtown Nashville and you can't go wrong there either (as Jeff would say, it's a good place to get the meat sweats)! DRR - You grew up in Iowa but recently moved to the Tennessee area. What prompted the move to the Volunteer State? Lane - I've always wanted to be closer to the heart of racing and Tennessee seems to fit that well. The fact that I was thinking about a career change, my wife's parents had retired to the Tennessee around 10 years ago, and our new home is about 4 miles from Jeff Burns' house, it seemed too good to be true. DRR - As long as I've known you, I've only seen you in a dragster. What's your feeling on door cars? Lane - For almost 10 years, I drove a door car exclusively and have always been a fan of door cars (except when they are whipping me). I think I gravitated toward dragsters since I really liked going fast and I've gotten lazier as I get older. The dragsters are easier to work on and haul multiple cars, at least that's what I tell myself. Jeff keeps threatening to put a blower in a door car so who knows what the future holds? DRR - If you "inked" a big sponsorship, what would the dream company or product be? Lane - One of our best customers from my past career, Pilatus, an aircraft manufacturer from Switzerland, showed some interest in getting involved and sponsoring a race car. They are great to work with, manufacture awesome aircraft, and that would be a pretty neat sponsorship. However, "Team Slushy" could really use a Fat Tuesday sponsorship to supplement our pit space's consumption of their products! I can see it now, Jeff would have a full support trailer with a rolling Fat Tuesday facility loaded with slushy machines for everyone to enjoy. DRR - Lane, Thanks for spending some time with us on DragRaceResults.com, Best of luck out in Las Vegas this week and for the rest of 2018.